It’s another Off The Wall Sunday Interview day, everyone! 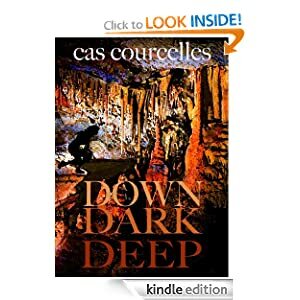 Today, I am pleased to introduce another of my writer’s group, Cas Courcelle. If you dropped by on Friday, I posted a taste of her story Down Dark Deep. If you missed it, you can find it here. Simply put, I like to daydream. What does your writing process look like? Where, when, how (computer, pen/paper or both) do you write? I use a computer now—the keyboard lets me keep up with my thoughts, something that was very hard to do when I wrote my first book by hand. And I don’t have to worry about deciphering my handwriting later on. Also, I need solitude—and solitaire. Keeps me focused. Have you written any other scary stories besides Down Dark Deep? Is this a genre in which you normally write? I like to write suspense, but I could do horror in the future. Who knows what might inspire me? What compelled you to write Tickle Games and Down Dark Deep? Do you normally read stories in this genre? If so, what is it about these types of stories that you like? I have read many suspense novels, but not so much in the horror genre. But a good story is a good story, although I want to be engrossed, not grossed out. Would you like to share any social media sites (Facebook, Twitter, blog, etc) where we can find you? I have a Facebook page under Cas Courcelles. I’m on Twitter under the same name. In closing, is there anything more you’d like to say? Desperately busy today as we are leaving for UK but I just had to pop in to read your interview. What a super cover. I heartily second the last sentiment. This is a really great interview! Being a writer is like the ultimate job for daydreamers! Great interview! I completely agree with you about daydreaming. It’s what inspires so many great stories! Thanks, Cheri! What would fiction writers do if they didn’t daydream?